Click on a category below to see contact information for important resources. Peer-to-peer support for people who are vulnerable or in crisis, or wanting to experience healing, recovery, and wellness. A non-crisis line that allows peers to talk to peers during a non-crisis situation. Provides education, support, recovery, advocacy, and governance to those affected by mental illness. Helps people with intellectual and developmental disabilities achieve success by advocating, supporting, and promoting full participation in our community. 1601 E. Fourth Plain Blvd. Providing a welcoming and safe environment to help veterans and their families get benefits and services to meet basic needs. Tribal members who manage a growing portfolio of health, education, scientific research, housing, transportation, development, elder care, conservation, and legal issues. Provides and facilitates access to free, compassionate, quality health care for children and adults who are otherwise unable to get such services. Faith-based organization that offers programs for the vulnerable, the needy, the poor, the hurting, the helpless, and the hopeless. The nation’s leading community-based nonprofit dedicated to addressing the needs of those living with mental illness and promoting the overall mental health of all Americans. Teens (and others) can text 741741 from anywhere in the United States to talk with a crisis counselor. The nation’s largest grassroots mental health organization dedicated to building better lives for the millions of Americans affected by mental illness. Lead federal agency for research on mental disorders. 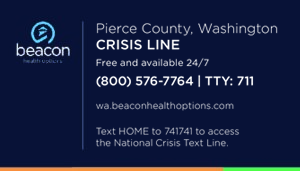 National network of local crisis centers that provides 24/7 free and confidential emotional support for people in suicidal crisis or emotional distress. The agency within the U.S. Department of Health and Human Services that leads public health efforts to advance the behavioral health of the nation. Helps individuals with disabilities to participate fully in their communities and become employed. A free program that helps individuals find a job. Offers one-on-one support with a job specialist, interview preparation, job search services, career skills development, and free English classes. Provides free residential education and job training for young adults ages 16 to 24. 5411 E. Mill Plain Blvd. Operated by Consumer Voices Are Born, and offers services and support to individuals to reach recovery and vocational goals. Statewide partnership of state, local, and nonprofit agencies that provides employment and training services to job seekers and employers of Washington. HUD-certified housing/counseling agency that provides financial education and neutral-based counseling services to promote financial security, employment opportunities, homeownership, and housing stability. Hotline to learn about shelter and housing to help in Clark County, Washington. Provides community-based services that enhance the quality of life for children, youth, and families. Serves both state-dependent and non-state involved youth ages 9 to 17 and their families. Provides reunification and medication services, social skills training, education, and aftercare support. Family shelter serving homeless families and children in need in the Vancouver, Washington area. Housing community that focuses on recovery from drug and alcohol addiction. Helps homeless individuals and families with opportunities that foster self-sufficiency through affordable housing partnered with community services. Provides affordable rental housing and housing assistance. Non-emergency transportation assistance in SW Washington for those services covered by Medicaid. Provides transportation to the closest medical provider of type in your community. *Providers listed below serve Medicaid and uninsured individuals in Clark and Skamania Counties (subject to change). Confirm eligibility for program prior to initiating services. Provides outpatient integrated mental health, addiction, and housing services, focusing on individual strengths and recovery. 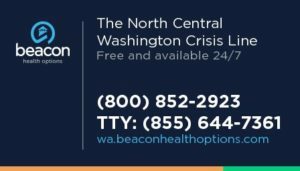 Provides outpatient behavioral health and recovery services to children, adults, and families in the communities of southwest Washington. North Star program for outpatient methadone treatment, and Eclipse program for young adult (18 to 25) outpatient treatment. 6926 NE Fourth Plain Blvd. Serves individuals, families, children, and communities struggling with poverty and the effects of intolerance and racism. Provides outpatient mental health treatment for youth and their families on Medicaid. Provides outpatient mental health treatment for youth and their families. Helps build a stronger family through communication, stress management, parenting, and problem-solving skills. Adolescent substance use disorder and co-occurring mental health treatment for youth aged 12 to 18. Offers outpatient and inpatient services. Available to youth aged 10 to 18 years old. Provides one-on-one therapy, group sessions, and family education. Daybreak offers intensive, gender-specific inpatient recovery programs for teens age 12 to 18. Includes individual therapy, family therapy, recovery education, skills training groups, and support meetings. 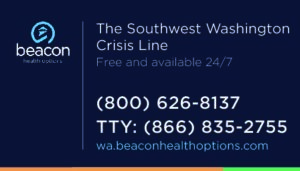 Youth mental health outpatient facility that provides a wide range of mental health services to meet the needs of children, youth, and their families in southwest Washington. Youth mental health outpatient facility that provides a range of innovative and cost-effective in-home services to children and families. Provides comprehensive mental health assessments, professional individual counseling for children, adolescents, adults, and geriatric clients, 24-hour crisis support services, and group therapy. *Providers listed below serve Medicaid and uninsured individuals in Clark and Skamania Counties (subject to change). Confirm eligibility for program prior to starting services. Provides inpatient detoxification and substance use treatment, as well as outpatient substance use treatment programs. Provides outpatient services for crime victims, immigration counseling, advocacy, refugee resettlement services, ESL tutoring, citizenship classes, and mental health counseling. Provides comprehensive mental health assessments; professional individual counseling for children, adolescents, adults, and geriatric clients; 24-hour crisis support services; and group therapy. Provides outpatient mental health services and case management for adults and children, as well as chemical dependency counseling. A private, not-for-profit treatment center for alcohol and other drug addictions. Offers inpatient and outpatient services for adults 18 and older. Evaluation and Treatment Center that is an 11-bed facility providing voluntary and involuntary inpatient evaluation and treatment to those who are experiencing acute psychiatric distress. Affordable drug rehab that specializes in methadone detox, Suboxone detox, and other outpatient addiction treatments. Mental health counseling services with locations throughout the Portland and Vancouver, Washington metro areas. Copyright © 2019 Beacon Health Options. All rights reserved.